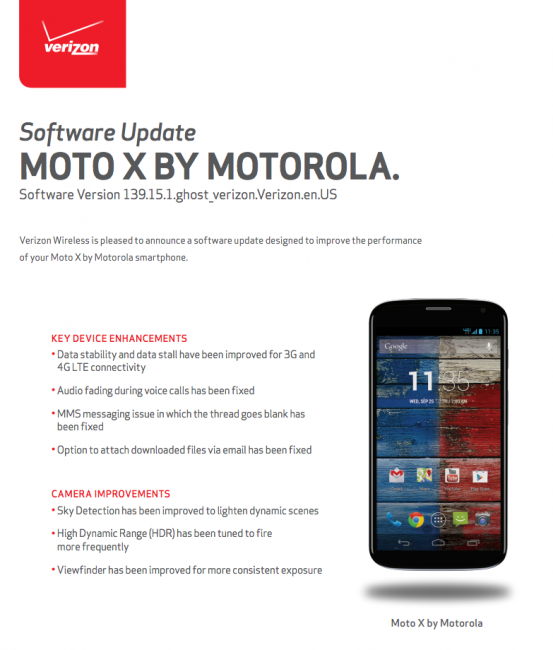 Motorola began pushing out the much-anticipated camera fixing update to the Verizon Moto X yesterday, mostly to members of their Motorola Feedback Network. They gave us an official changelog which listed out the same set of fixes that similar updates for AT&T, Sprint, T-Mo, and US Cellular variants received, however, Verizon posted their own today. Once updated, Verizon expects you to have a more stable 3G and 4G LTE connection, better voice calls without audio fading, and download files from email without issue. In terms of camera improvements, Big Red says that “Sky Detection” has been improved, HDR will now fire more frequently, and the viewfinder has been improved for more consistent exposure. Again, this is the update you have all been waiting for. Well, until Google introduces Kit Kat.